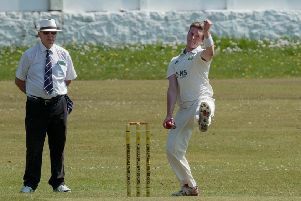 A 24-point weekend has pushed Salesbury off bottom spot in the Ribblesdale Cricket League Section A. Maximum return for Chris Riley’s side saw the Red Caps leapfrog Euxton out of the automatic relegation spot. Sam Bristol sparkled throughout in a spectacularly prolific spell, claiming a total of 11 wickets in wins over Cherry Tree and Whalley. And Andrew Mercer is the Ribblesdale Cricket League’s leading wicket taker, following his fantastic five star performance against their Ribble Valley rivals at Ribchester Road. Mercer took his fourth five-fer of the season, conceding 45 runs from 15 overs, as the hosts won by six wickets. Bristol added 5-29 from 14 overs in the same fixture as Whalley were wiped out for 78, ultimately inflicting a huge blow to their title dreams. Mark Fallon (18), Stuart Crabtree (14) and Sam Sweeney (14) were the only batsmen to make double digits for the visitors in a largely disappointing afternoon. Salesbury didn’t waste any time in their reply, knocking the runs off inside 20 overs with just four wickets down. Professional Neil Hornbuckle batted right through to the end, finishing with eight fours and a six in a 50-ball knock of 54 to secure victory. Riley and Bristol then combined to dismantle Cherry Tree, again on home soil. The skipper top-scored with 55 in Salesbury’s 79-run triumph as they culminated the innings with 146. Opener Hornbuckle (27) and Brandon Faber (22) also made significant contributions. Bristol then dominated with the ball in taking 6-21, his best figures of the campaign, while the club’s paid man added 3-11 in 5.5 overs.